China's popular messaging app WeChat now counts 1 billion monthly active users (MAU) worldwide, up 12% from 889 million MAU in Q4 2016, according to Tencent CEO Pony Ma. Ma said the platform reached the record figure during last month's Lunar New Year Festival. However, it's important to note that Tencent refers to MAU as user accounts, rather than individuals. WeChat users can create multiple accounts, and it's common for a user to create both a personal account and a business account. For WeChat users, the app acts as a central hub of the digital world — consumers use it to perform tasks ranging from texting and calling friends, to paying bills for goods and services, to booking doctor appointments. WeChat's recent user growth is likely driven by international users. 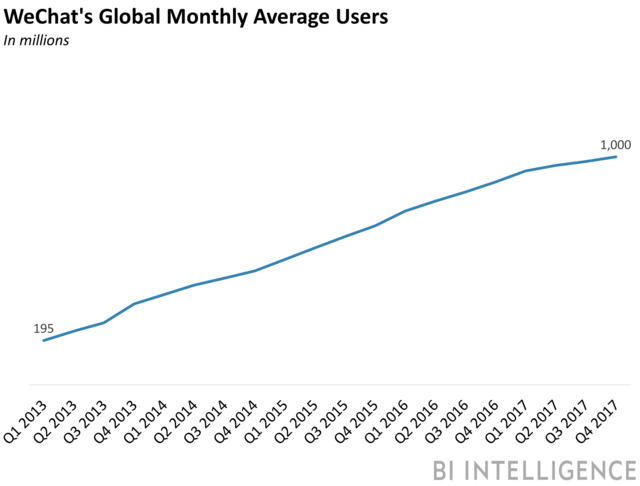 Most of the recent user growth likely came from Southeast Asia, Europe, and the US, according to founder of WeChat-focused consultancy ChinaChannel Matthew Brennan. With WeChat nearing saturation within its domestic market, the Tencent-owned company is banking on international expansion to drive growth. Roughly 83% of all smartphone users in China use WeChat. WeChat's penetration of smartphone users jumps up to 93% in China's Tier 1 cities. As of August 2017, there were around 100 million international WeChat users. However, WeChat may hit a speed bump as it looks to expand further internationally. Although chat apps are rapidly spreading globally, many countries and regions already have one app or another that dominates. For example, WhatsApp and Facebook are the preferred chat apps for a majority of smartphone users globally, especially Android users, with a few exceptions including China, Japan, and South Korea. WeChat will face some difficulty swaying users already signed up to these apps.